Admit Control Request Queue screen. Click to enlarge. 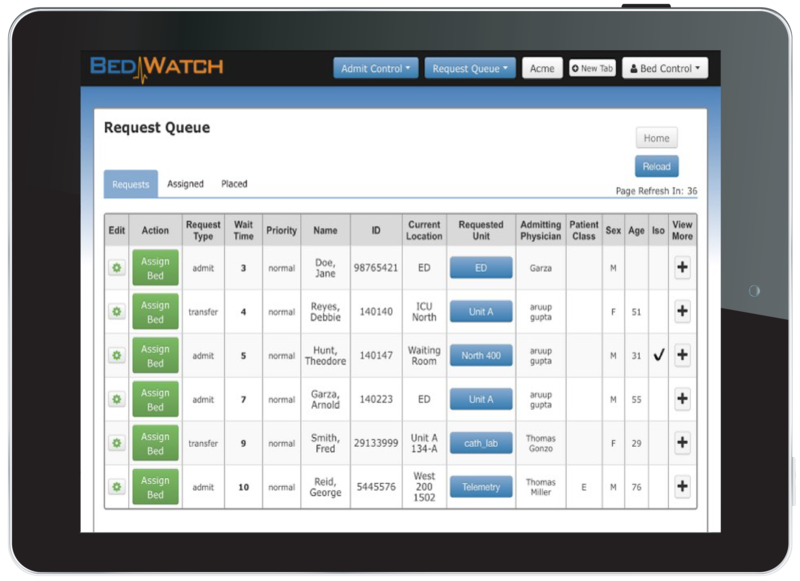 BedWatch® Admit Control allows users to fully integrate incoming patient information from all sources with Bed Control and Transport Control to allow placement staff to effectively manage beds and place patients faster. Together, Bed Control, Transport Control, and Admit Control deliver a comprehensive, door-to-door patient throughput management tool. With Admit Control, hospital placement staff can centrally manage incoming patient placement requests, and automatically update the Bed Board in real time, as placement decisions are made. The app also integrates with Transport Control, so users can automatically generate a patient transport request from Admit Control once a bed assignment has been made. An intuitive user interface ensures training time is minimal and no down-time is necessary to implement Admit Control, and free updates and upgrades ensure our partners consistently have access to the most up-to-date version of the product. BedWatch Admit Control provides all necessary placement information at users’ fingertips. Seamless integration and real-time visibility help hospital staff manage throughput more efficiently and effectively. Dynamic dashboards and comprehensive time-and-date-stamped reporting provides a wealth of objective, actionable data to help hospital administrators identify chronic process issues or bottlenecks, and address them in order to drive significant, lasting process improvement.